One advantage to college is that it exposes you to subjects that you otherwise may not have touched. For me this is science. In high school I was encouraged to take agriculture as my science requirement because of my poor math skills. Since I lived on my grandparent’s farm during the summer months I laughed that I could take a class doing things I did on a daily basis. Needless to say I aced this “science” class, but my knowledge of general science was woefully lacking. During my early adult years I stayed away from science thinking I was not smart enough to get it. After taking a biology class three years ago, I found not only am I smart enough to get it, I love it and want to learn all I can. Most of my education has come from reading science books though I have taken three science classes since biology. Early this summer I decided to learn more about evolution. Sure I had the basics down, but really not enough to hold a good debate with a creationist. Like most people what I “knew” came from what I had heard, not from what I read. One way to learn more about evolution was to read Darwin himself, but this turned out to be a very dry and boring read I am sorry to say. I looked for a modern guide to evolution; after all, we have learned so much since Darwin, surly there was someone out there who wrote about it in a way layman can understand. To my surprise it was Richard Dawkins who has written a book that I feel Darwin would have written if he had all the facts, terms and evidence we have now. Like many of my readers I only knew Dawkins from The God Delusion and The Blind Watchmaker. I tried to read The God Delusion but was turned off by his attack on religion without giving it any credit for making people’s lives better. I did not know Dawkins is a biologist and a rather knowledgeable and engaging one at that. His latest book The Greatest Show on Earth, the evidence for evolution taught me and more importantly (at least in my mind) it got me asking questions. This is how I gauge if I am truly learning anything, when I ask follow up questions. The book reads like a course in evolution. Dawkins starts with examples of evolution or mutation by artificial means. What we all take for granted we may not understand is a type of evolution. Over thousands of years man has taken the wolf from a village scavenger to the many breeds of dogs we see today. A scientist in Russia did the same with foxes in the 1950’s and within just a few short generations had tame foxes that started to look and act like dogs, from the floppy ears to loyal behavior. Dawkins points to plant breeding; from our early ancestors changing wild plants to the grains and cabbages we have today, to the award winning roses we all know and love. 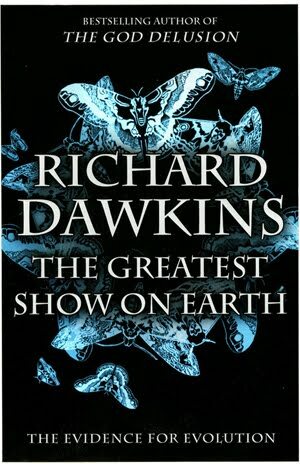 Dawkins starts here so the reader becomes comfortable with the idea of evolution and gene mutation. The book then moves on to how genes mutate and how DNA really works. Those who may not have been exposed to these subjects beforehand can take heart that Dawkins explains this in layman’s terms. Those who have a firm grasp on the subjects can enjoy Dawkins examples of rapid evolution. There is a great story of a biologist who does an experiment on fish to determine how long it would take for them to change their spot patterns depending on if they had local predators. I won’t spoil it for you, but will say I have some good ammunition loaded with facts for the next round of discussions with my aunt. I will admit the middle of the book dragged a little for me. Here Dawkins goes through the nine months of gestation. Even Dawkins admits this is a little digression, but he did have a point to make. I think he could have made the point in less time. This is my only negative thoughts on the book; at times Dawkins eloquently explains something but then spends another page or two explaining what he just said. Either Dawkins does not have confidence in his ability to get a point across or he does not have confidence his reader will fully understand some key points. I found myself skipping some parts because of this. Over all I would highly recommend this book to anyone who wants a better understanding of evolution or science in general. The book is has some English humor and is easy to understand. I think we all should have a good grasp on science if only to make us better consumers. Many books and late night infomercials rely on our lack of science based knowledge in order to sell us cheesy ideas or products. Dawkins may not stop you from purchasing a glass plant watering globe that magically knows when your plants are dry, but I bet you never look at a dog or plant the same way again. And for a really great book on all things science I recommend Bill Bryson’s A short history of nearly everything. If you dear readers have a favorite science book be sure to leave a comment. I am always on the lookout for a good science read. Greg you are so welcome! I love your comments as I am trying to become a better reviewer. Some Day I will write one as good as Book Pusher. She is the best!Don't you just love Creationists who deny the existence of dinosaurs? I have an aunt who thinks they are a hoax. As Luis Black would say "I just laugh, then take a fossil out of my pocket and throw it at em". I love this line!Bryson's book is my favorite science book. I learned so much from this book. I am glad to know you liked it too. Wow Sari thank you and I was going to say what a great review to, I think I have to give Dawkins another go after that. I feel guilty because I don't read much science, some Dava Sobel and the occassional book on paleontology or nature. I have my eye on a book about sharks at the moment, called The Shark in Peril, here there is growing concern over shark attacks and their regular proximity to beaches, I think I better never go swimming at the beach because I'm on the sharks side and after my statements about it being their environment and serve us right for depleting their natual food supply. Anyway my all time favourite science book was Robert Bakker's Dinosaur Heresies, that was a book that made science exciting, oh and The Future Eaters and The Weather Makers by Tim Flannery although I felt blinded by the science in Weather Makers, I only had a week to absorb it all, as I had it from the library and I think half the town had reserved it.Again great review. BP, I really like Robert Bakker. When my son was around 10 he wanted to be a paleontologist. Bakker had a series on TV about dinosaurs that my son watched faithfully. When we moved to Montana I was going to enroll Alex in a summer camp program that Jack Horner started but by then Alex changed his mind about being a paleontologist. Go figure. I have read a couple of books by Sobel; Planets being my favorite.You have sharks, we have bears, mountain lions and coyotes. For the same reason you talked about these creatures are attacking man more and more (okay coyotes are attacking dogs and cats at an alarming rate). I feel the same way you do; we in the states are tearing down forests and moving to the countryside, and wonder why the animals are getting closer! Man's ignorance of nature astounds me at times.I am going to look up Future Eaters, the title alone is worth a look. Thanks for the recommendations. And yes give this a try, I found the information fascinating. Hi, SariJ! I majored in Science when I was in college, Biology to be specific. So, evolution is something I feel passionate about since it's the core theme of biology. I just can't see how many people have trouble accepting this theory.Since you asked your readers for recommendations on science books, well, I've read quite a few. The best so far in my opinion is Robert Wright's The Moral Animal, which combines science, sociology, and anthropology in a very interesting and captivating non-fiction book. Another one that I enjoyed is Brian Greene's The Elegant Universe, which is a discussion of string theory. Greene makes a technical subject so accessible to his readers. Hey Peter,Wow, now I have a go to guy for science! I read the Greene book, but must admit it is a little over my head. I think I also have his Elegant Universe in my collection. I have not read Wrighte's book so I will look it up. Sounds good. Thanks for the recommendations. I would love to hear more from you on this subject. Do you have any other books on evolution to recommend? Another, shorter, evolution book is called Why Evolution is True by Jerry Coyne. Dawkins mentions it in the intro i think. it is also quite good and has points to specifcally refute creationism.Happy Reading! Thanks Melanie I will be sure to check this book out. Bearing in mind your affinity for biology, and your new found respect for Dawkins, I would highly recommend his book ‘The Selfish Gene’. It’s sort of a prequel to ‘The Greatest Show…’, but it talks more about the driving force behind evolution and more closely examines selection, whether natural or artificial. I may have this book somewhere in the house. I recall trying to read a couple of his including The Blind Watch Maker, but they were a little to dry for my taste. I will try the Selfish Gene again on your recommendation. Previous Previous post: Sari’s 2009 favorite book list.